The Type 1-320 Remote Charge Converter (RCC) is designed for use with single-ended piezoelectric transducers that do not have internal electronics. The 1-320 is available with fixed gains of 1.0 mV/pC or 10.0 mV/pC and are compatible with most vibration instrumentation systems like the CEC 8000 C-CATS. 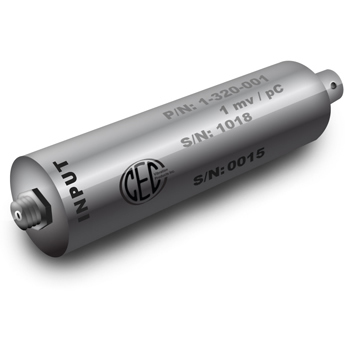 The 1-320 converts a high impedance charge input signal to a low impedance proportional voltage. This RCC utilizes a standard 2-wire constant current source within a range of 4 to 20 mA and a compliance voltage of 20 to 36 VDC. These low noise devices offer a wide frequency response of 2 to 45 kHz.